Satellite images of Mosul have revealed how fighters from so-called Islamic State have constructed multiple barricades across key routes into the northern Iraqi city. The imagery, released by US geopolitical intelligence company Stratfor and taken on 31 October, shows a defensive line built across the city's southern edge. The jihadists have also destroyed a number of buildings south of their positions around Mosul airport to enable them to observe advancing government forces, Stratfor says. About 50,000 Iraqi security forces, Kurdish Peshmerga fighters, Sunni Arab tribesmen and Shia militiamen, assisted by US-led coalition airstrikes, are currently involved in a military offensive to reclaim Mosul from IS militants. Government forces have already retaken dozens of villages and towns surrounding the city and entered its outskirts for the first time since it was seized in June 2014. The barricades constructed across key routes into the city have been made out of concrete blocks and other rubble, Stratfor's analysis says, possibly from the concrete walls of destroyed buildings. In other areas, the militants have stockpiled materials ready to block roads as the battle nears. The jihadists' defensive measures will pose a "substantial tactical challenge to the converging forces", according to Stratfor's analysis. Iraqi troops will either have to adjust their course to avoid running into IS positions head-on, or accept the risks of crossing open terrain to reach the dug-in IS fighters, it says. In the southern district of Wadi Hajar, a number of roads have been blocked while earthen defences have also been constructed. Just north of the airport, a large number of obstacles have been placed in multiple roads. 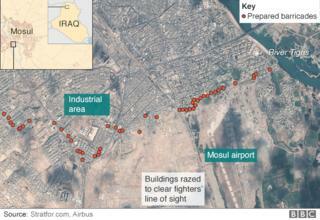 Nearly all of the buildings in the airport complex and the former military base to its west have been destroyed, Stratfor says.